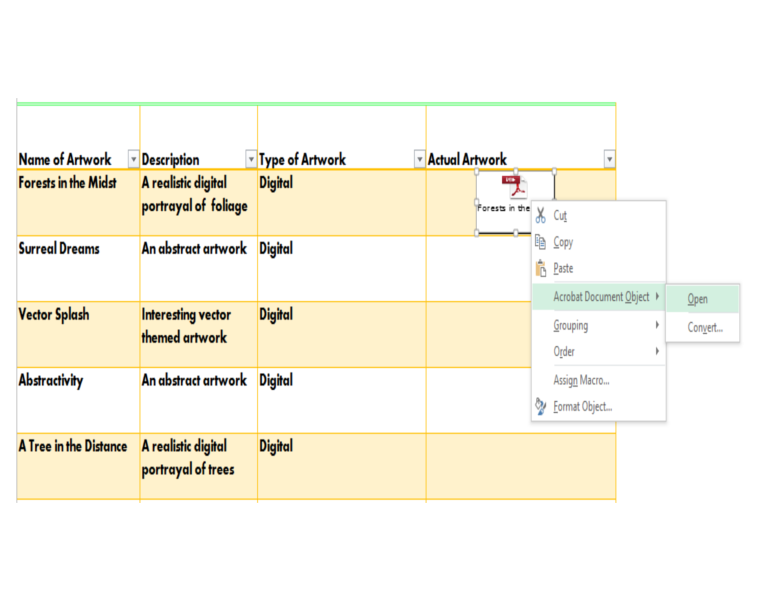 Inserting objects in Excel means that Excel actually stores these objects (PDF files, Word documents, or images in bitmap format in the actual spreadsheet itself). This can be useful, if you want to create a mini-database to store some of the objects listed above, using Excel. 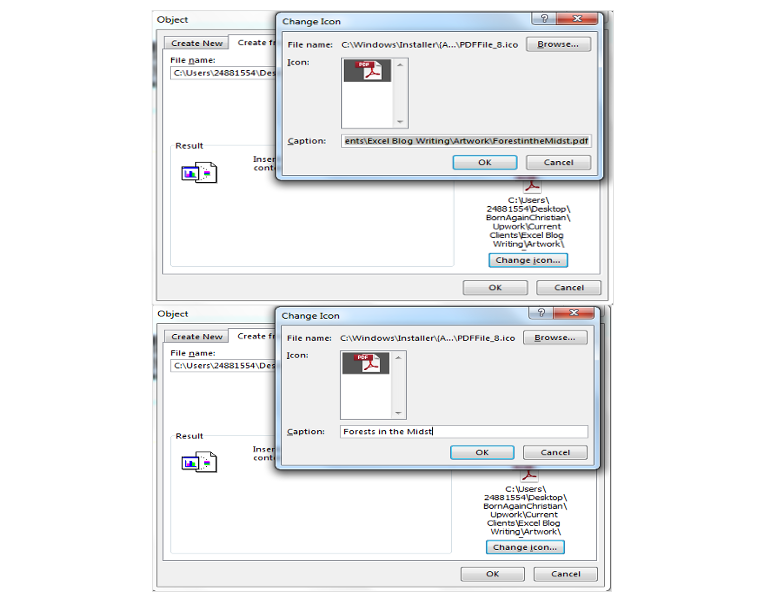 Since the object is actually embedded in the actual spreadsheet and can be opened from there. What do I mean by this? Well, let’s get started with a simple example. 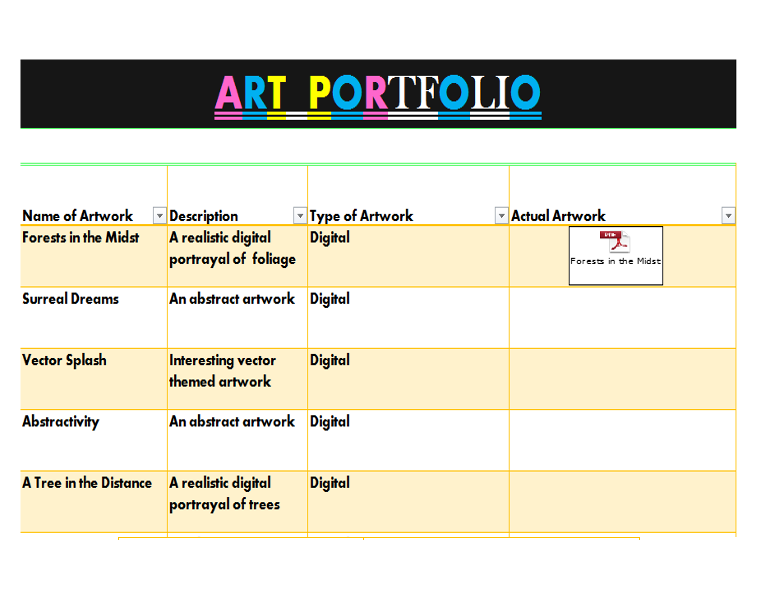 An artist has a portfolio of seven artworks. He usually sends these artworks to galleries, when he applies for exhibition space. 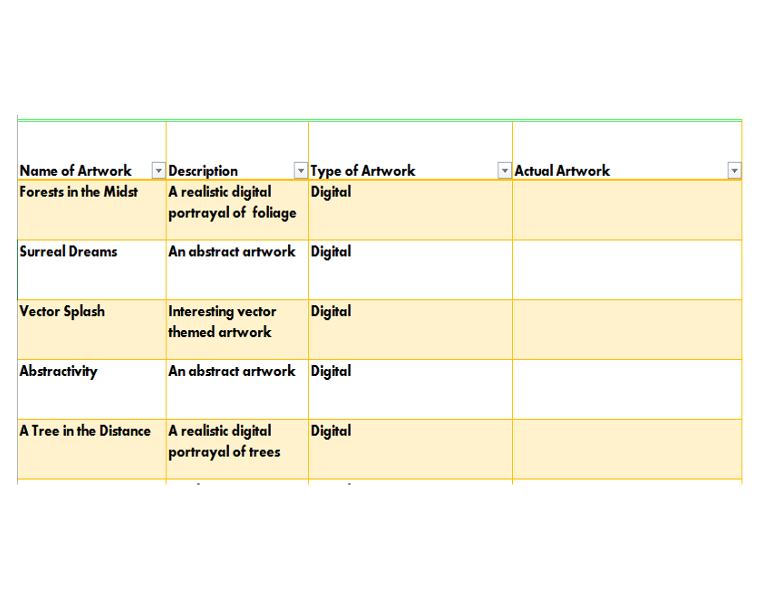 Usually, the galleries he applies too, require the name of the artwork, a description of the artwork, the type of art it is (traditional, digital, mixed media) and an image/pdf of the artwork itself. 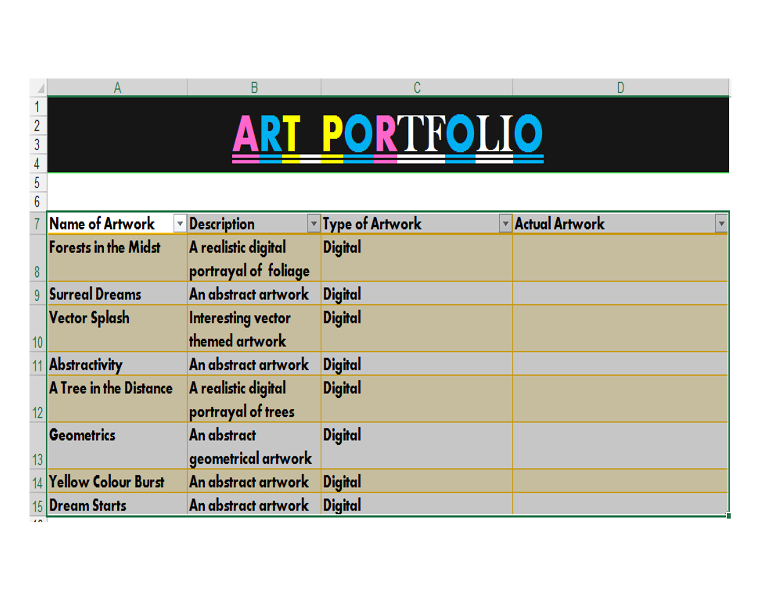 He has decided to use Excel to create an art portfolio to send to galleries. 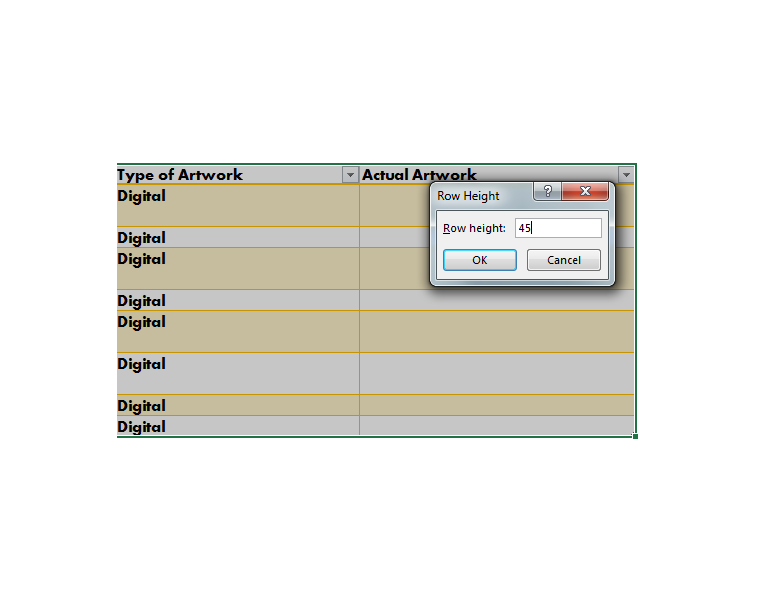 He has an Excel Table setup already, as shown below in the picture of the source data. 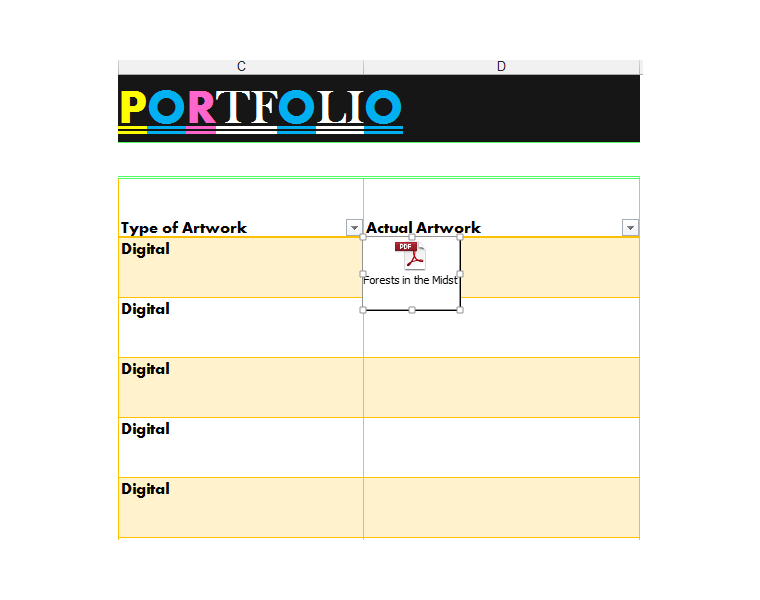 In this example, we are going to embed the artworks as objects in the form of Adobe PDF files in the Actual Artwork column. 1) Firstly, we will increase the row height of the entire table. 2) Press CTRL+SHIFT+* to select the entire table as shown. 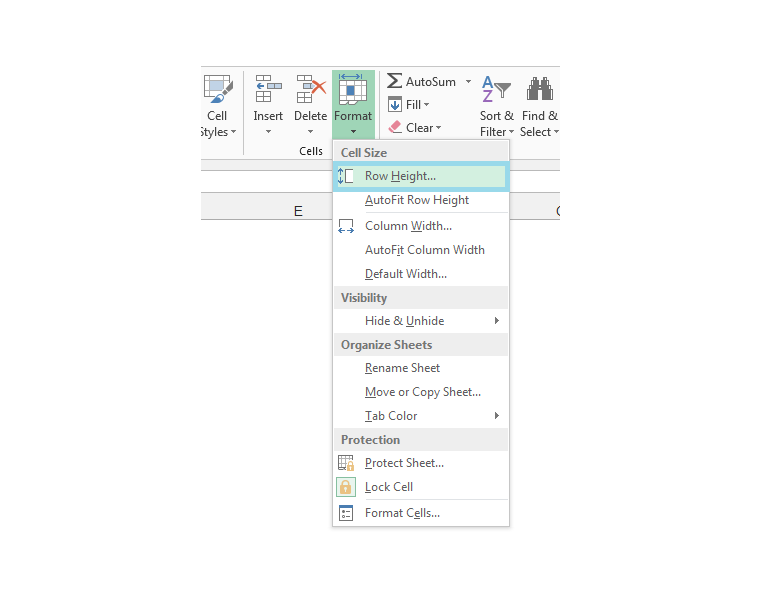 3) Go to the Home Tab, in the Cells group, click on the drop-down arrow for Format, and select Row Height as shown. 4) Set the row height to 45, in the Row Height dialog box and click Ok.
5) With Cell D8 selected, go to the Insert tab, in the Text group, click on Object in order to insert an object. 6) The Object dialog box will pop up. 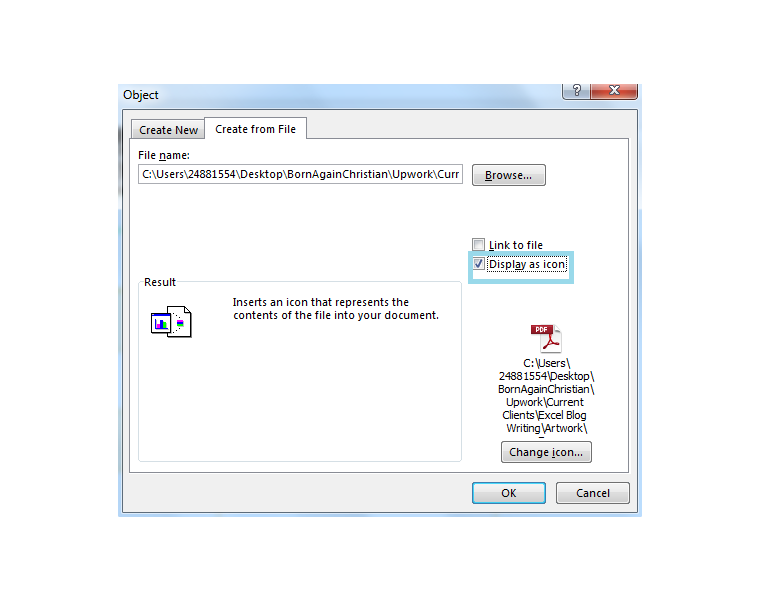 7) We are going to select the Create from File tab since our pdf files have already been created. 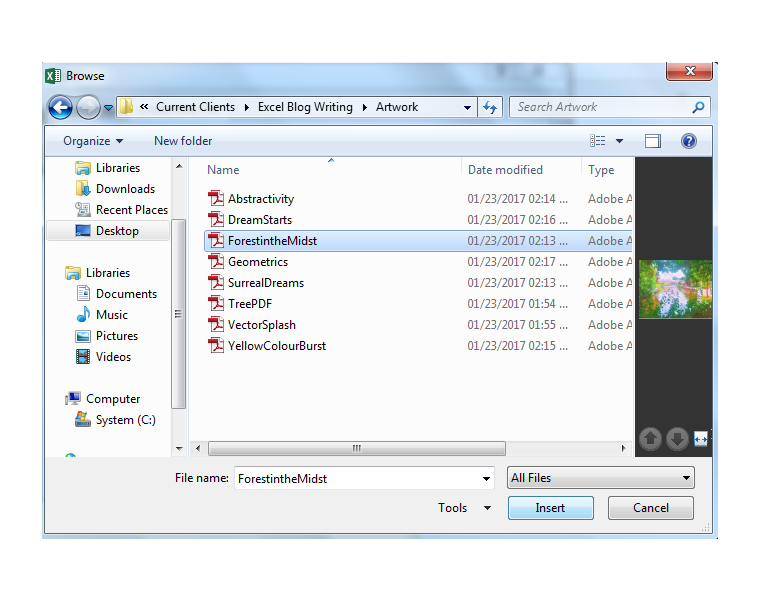 8) Browse to the folder containing the already made pdf files. 10) The Browse window is shown again. Now make sure the Display as icon check box is checked. 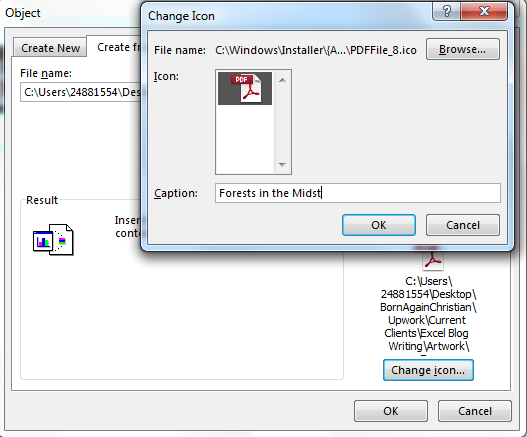 11) Then click on the Change icon button and the Change Icon dialog box pops up. 12) Change the Caption to Forest in the midst. Click Ok and then Ok again. 13) The object is now inserted. 14) Resize the object, by clicking on the handles and making it smaller, in the same way, that one would resize an AutoShape. You can also move the object to the middle of the cell D8. 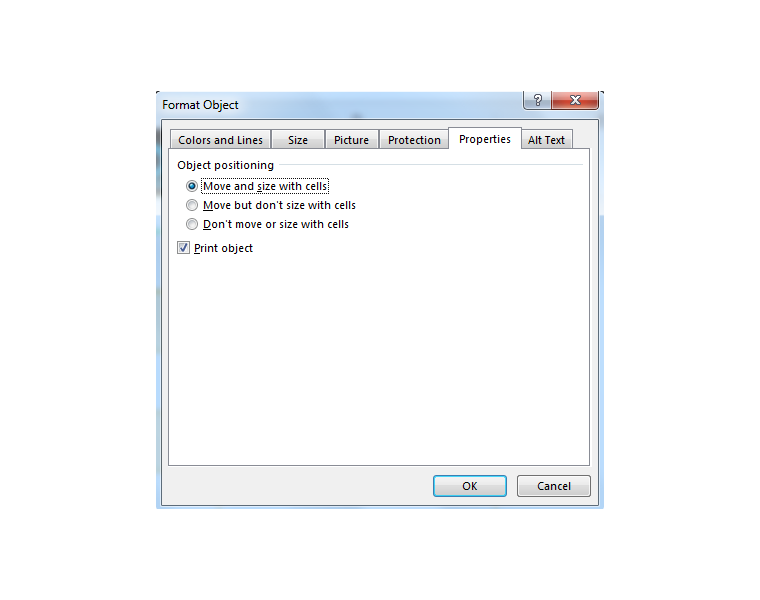 15) Right-click the inserted object and select Format Object. 16) In the Format Object dialog box, in the Properties tab, make sure Move and size with cells are checked and click Ok. 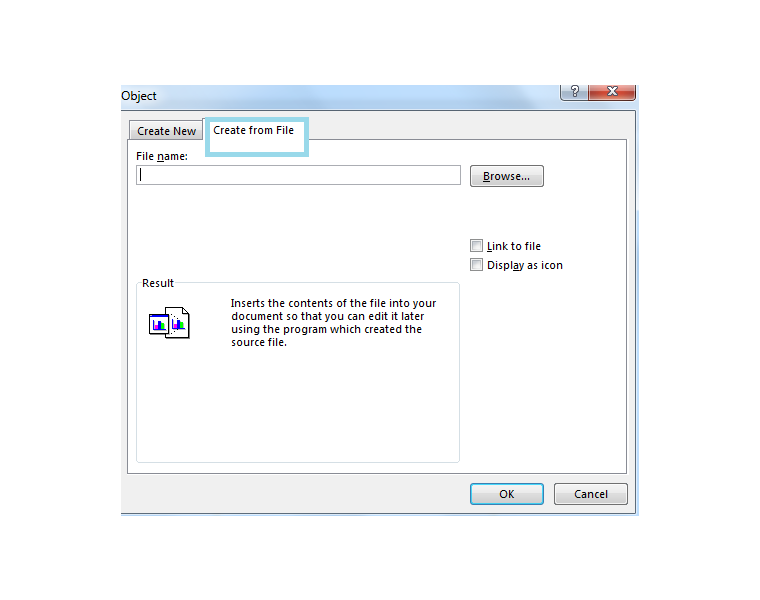 This ensures that if you filter the Excel Table, the object moves with its row. 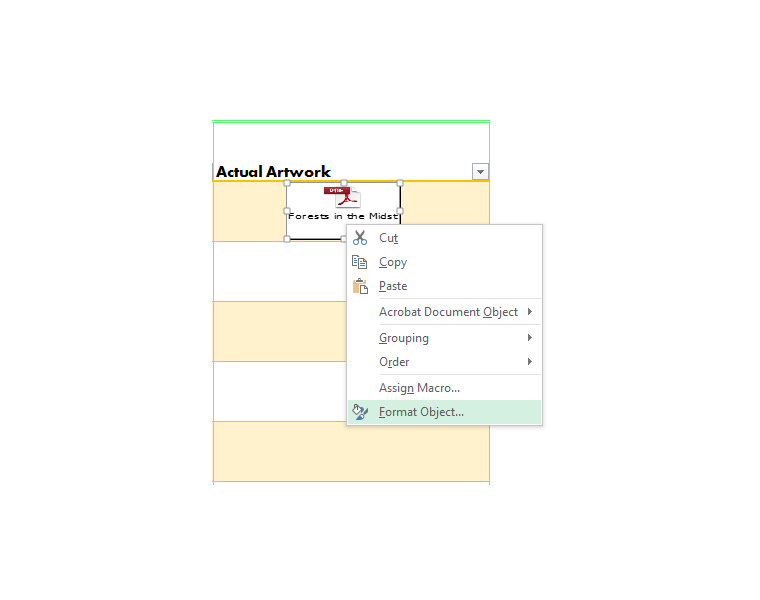 17) You can either double-click the object to open the PDF containing the artwork, or you can right-click the object, select Acrobat Document Object, Open. 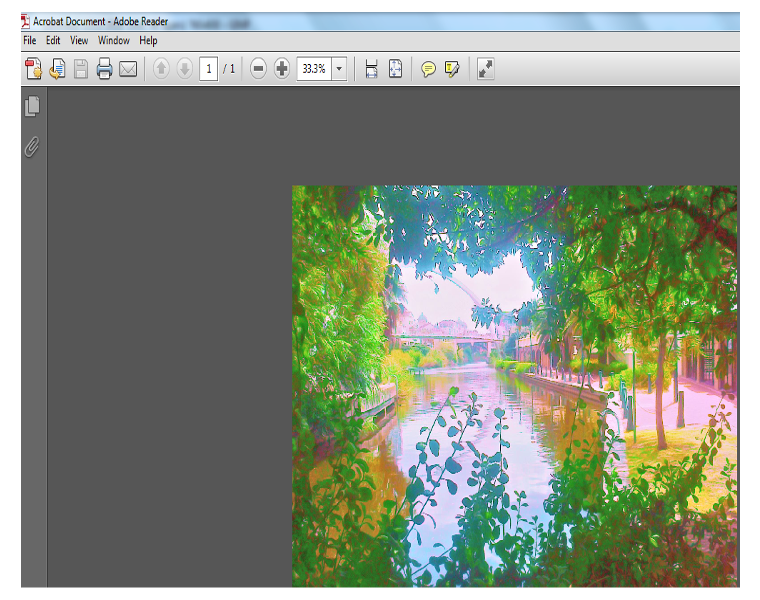 This opens the artwork in Adobe PDF reader. 18) Now repeat the same process for the other artwork. 19) Upon completion, you should have a Table with all the artworks embedded as objects. 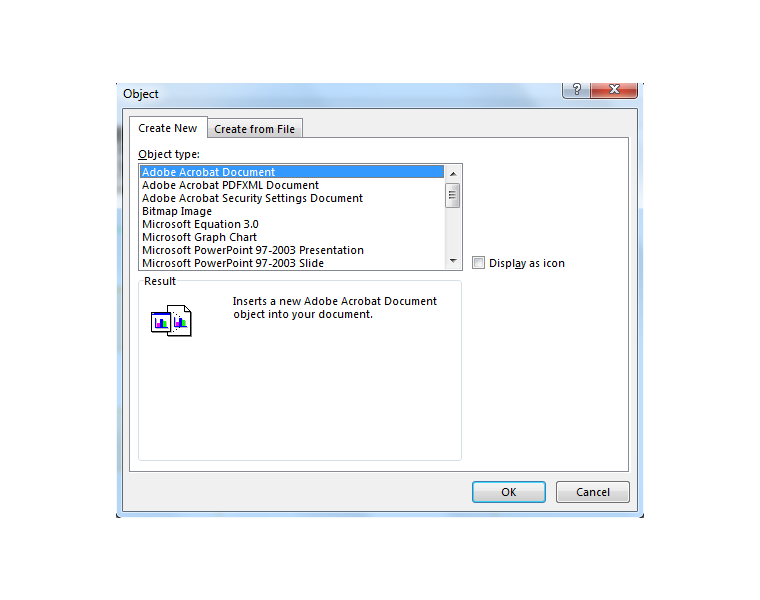 Embedding objects such as Adobe PDF files, Word documents and PowerPoint files in Excel spreadsheets is a very useful feature. 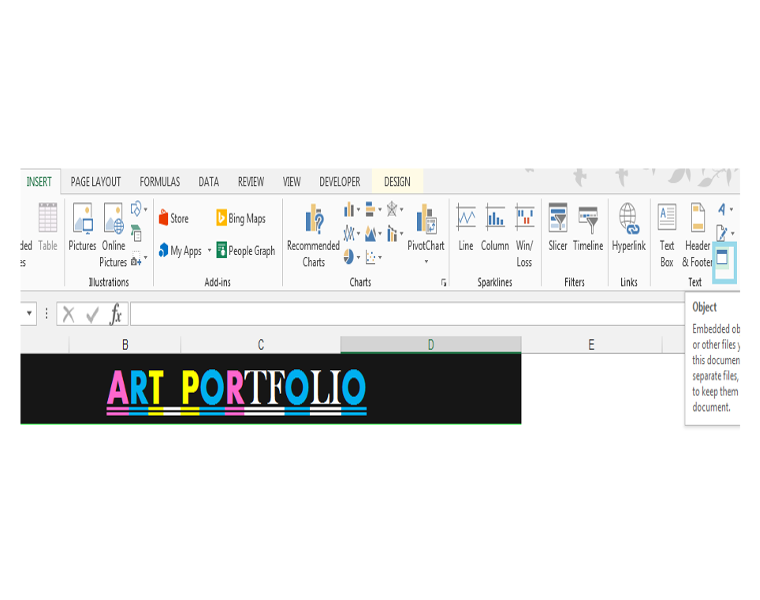 In the above example, there is now no need to send the files separately as attachments because all the artworks are already in the Excel file. 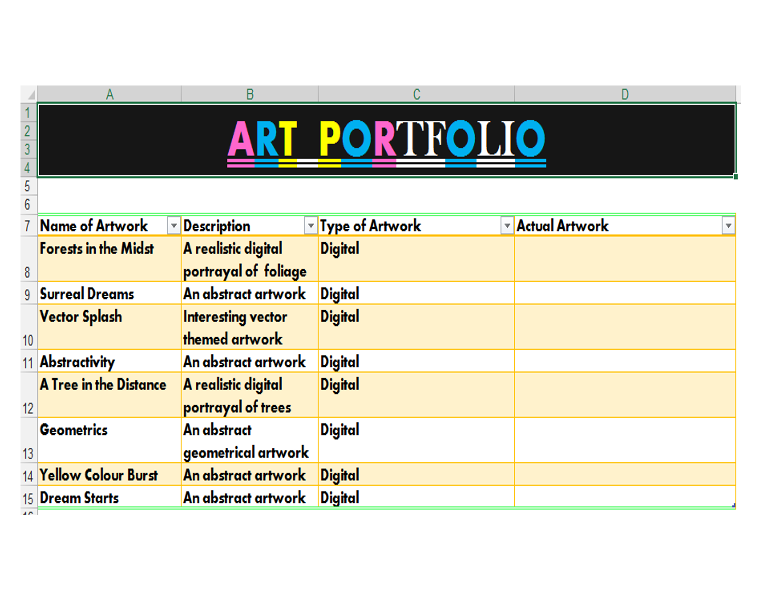 So, the artist can just send his portfolio by sending only the Excel spreadsheet, which is neatly organized in Table format with columns containing all the needed data. 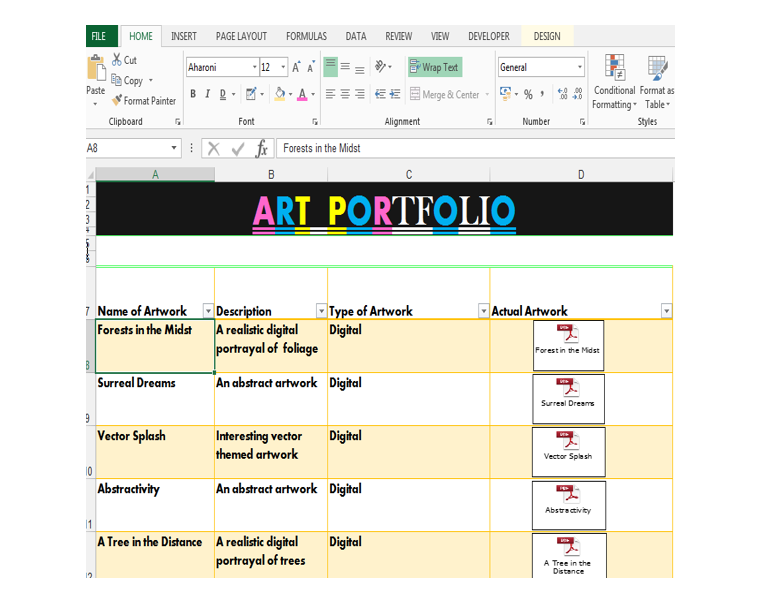 Please feel free to comment and tell us if you use Excel for artistic purposes, in addition to data analysis.